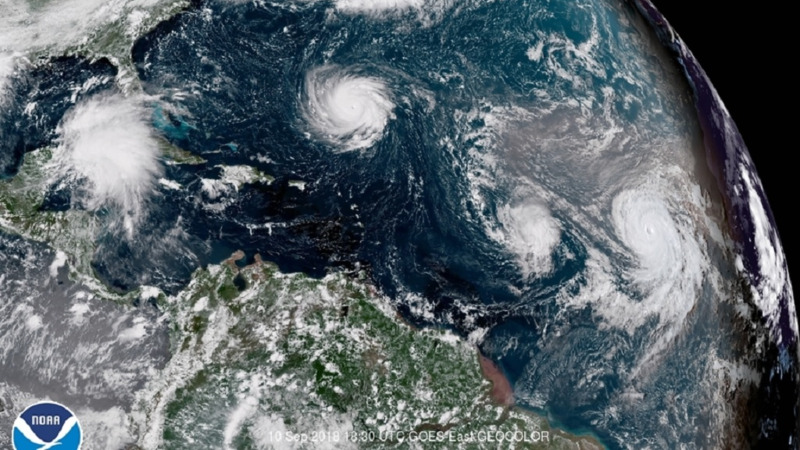 Hurricanes Florence, Isaac and Helene moving through the Atlantic. Photo courtesy the NHC. 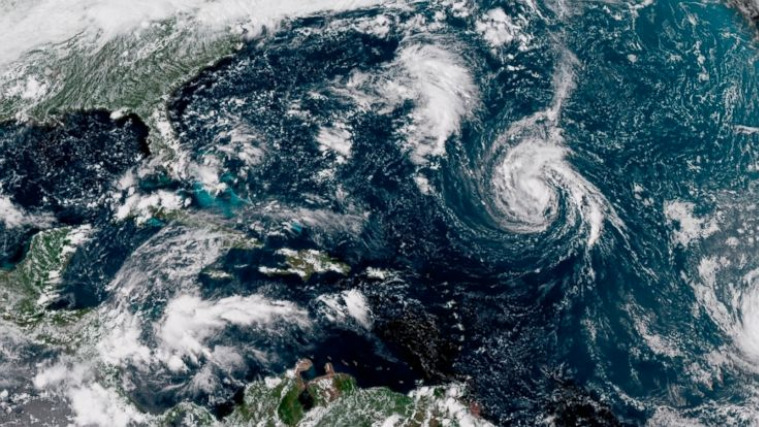 There are now three hurricanes active within the Atlantic, according to updates from the US National Hurricane Center. 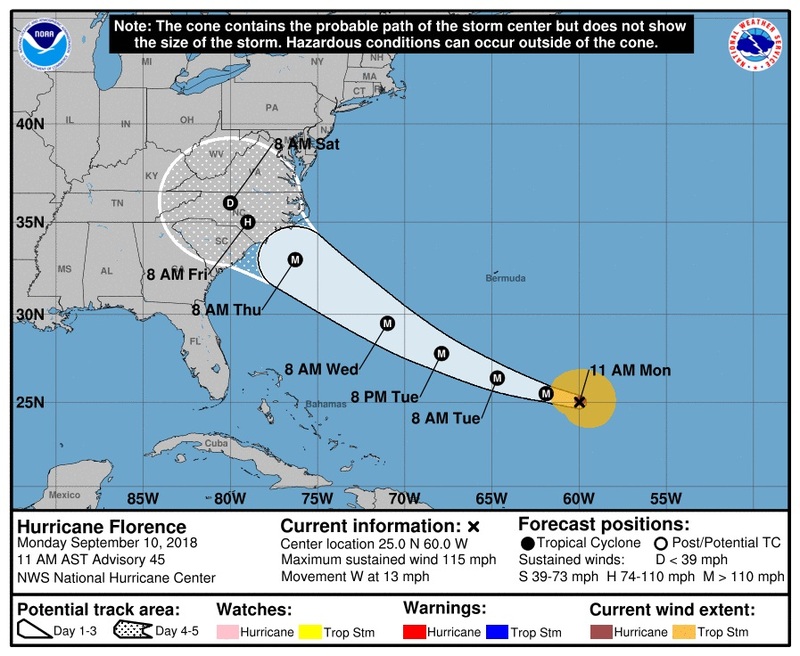 Hurricanes Florence, Isaac, and Helene are all moving on various paths within the Atlantic, and are being monitored by the NHC and other official weather agencies. 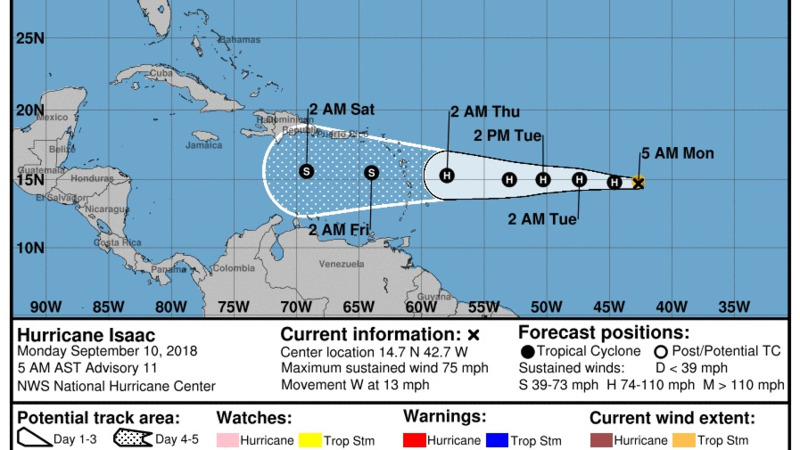 In an 11:00 am advisory on Monday, the NHC said there has been little change in strength as the storm continues west toward the Windward Islands. At 1100 AM AST (1500 UTC), the center of Hurricane Isaac was located near latitude 14.7 North, longitude 43.9 West. Isaac is moving toward the west near 14 mph (22 km/h). A westward motion with a slight increase in forward speed is expected through the end of the week. On the forecast track, Isaac should move across the Lesser Antilles and into the eastern Caribbean Sea on Thursday. Maximum sustained winds are near 75 mph (120 km/h) with higher gusts. Additional strengthening is expected over the next day or two. Weakening is forecast to begin by the middle of the week as Isaac approaches the Lesser Antilles. Hurricane-force winds extend outward up to 10 miles (20 km) from the center and tropical storm-force winds extend outward up to 45 miles (75 km). 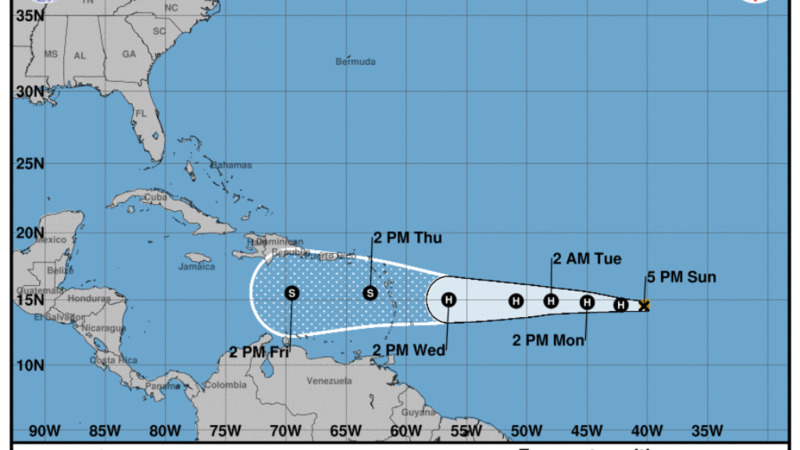 Interests in the Lesser Antilles should monitor the progress of Isaac. 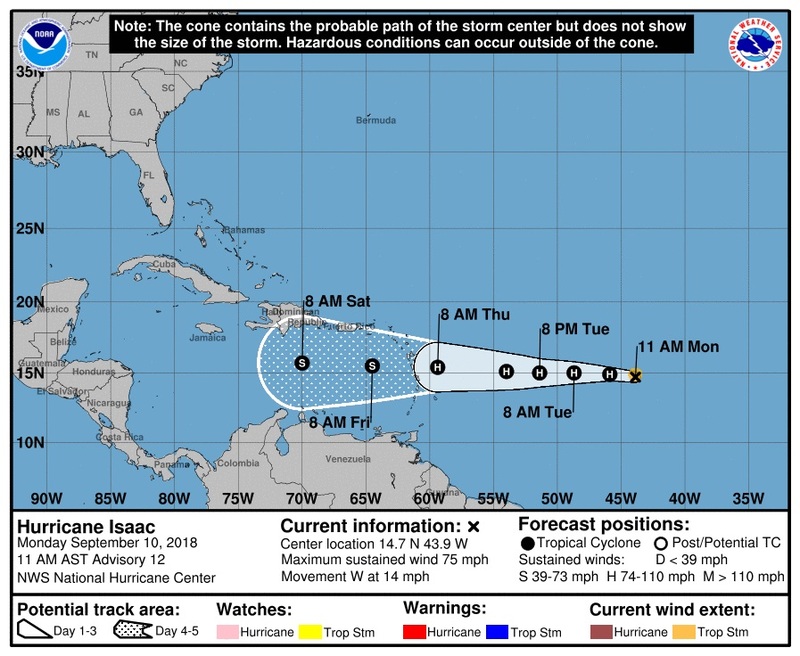 The Trinidad and Tobago Meteorological Service says Trinidad and Tobago will not be directly affected by Hurricane Isaac, however the islands may be impacted by feeder bands from the storm. Citizens are advised to follow the Met Office for updates. 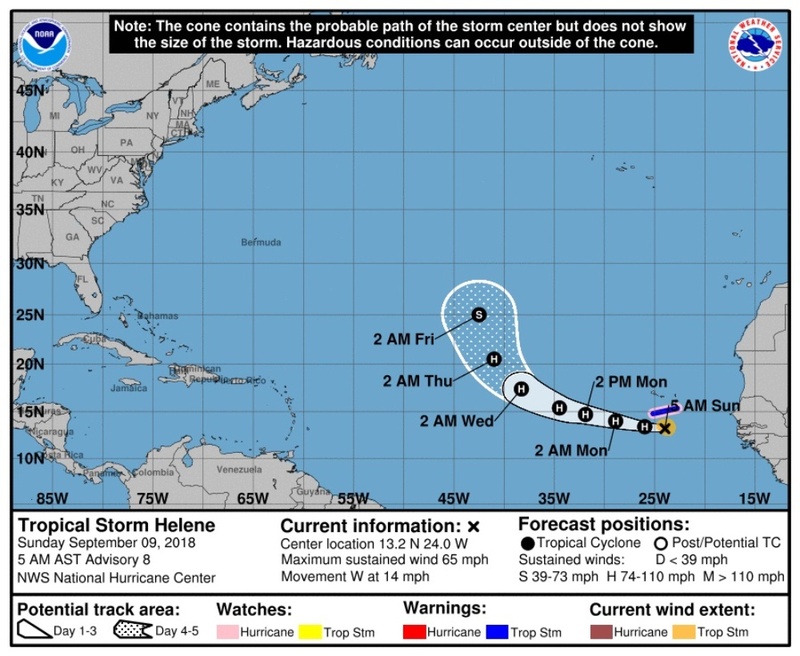 Meanwhile as of Monday midday, Hurricane Helene was located near latitude 14.6 North, longitude 30.0 West and continued moving toward the west-northwest near 16 mph (26 km/h). A west-northwestward motion with a decrease in forward speed is expected through late Tuesday, followed by a turn toward the northwest and then toward the north-northwest on Wednesday and Thursday. Maximum sustained winds have increased to near 105 mph (165 km/h) with higher gusts. Some additional strengthening is expected today, and Helene is forecast to become a major hurricane by tonight. Steady weakening is forecast to begin by late Tuesday.